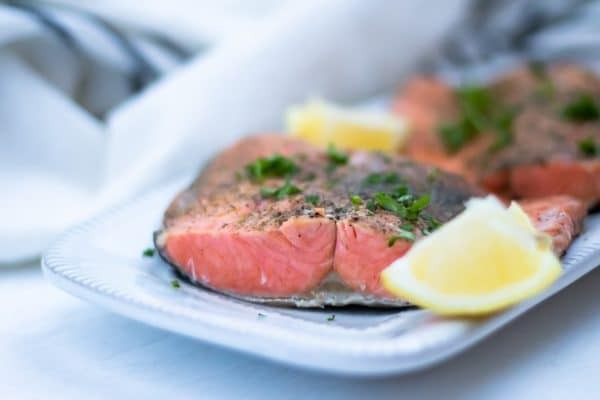 This SUPER easy healthy recipe for instant pot salmon is completely foolproof and can be made with fresh or frozen salmon. 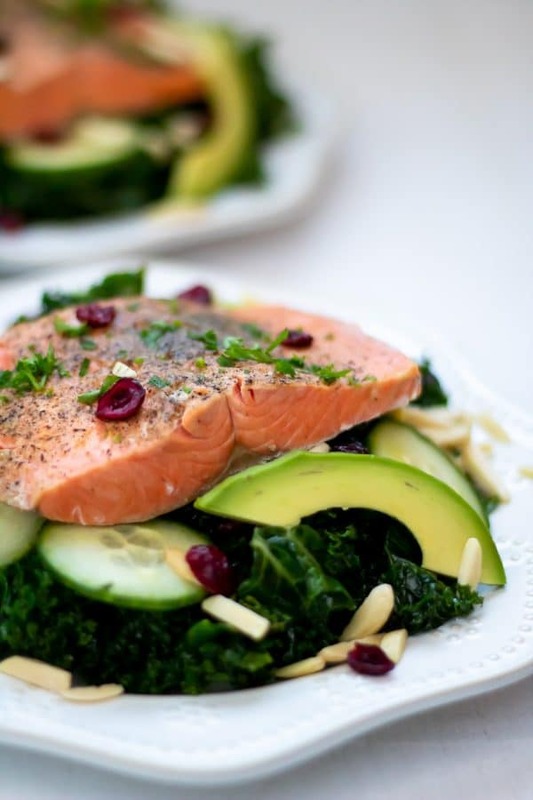 A delicious salmon dinner will be ready in under 15 minutes! 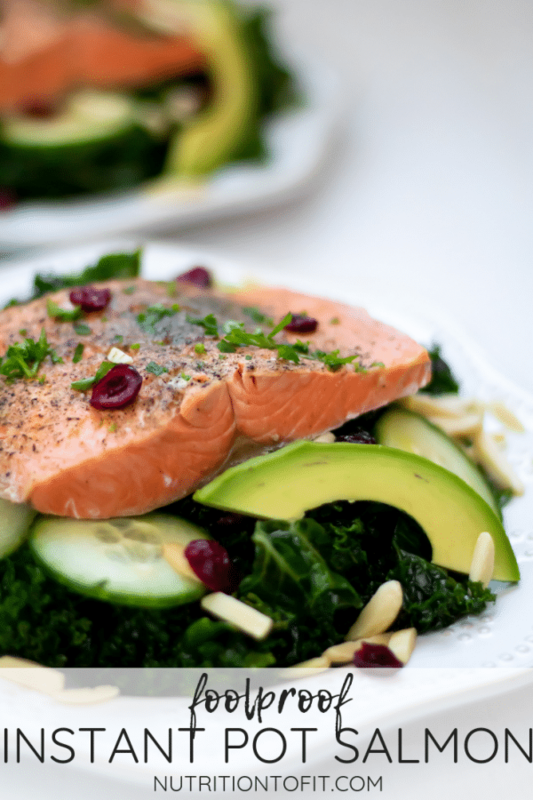 Salmon is my favorite fish and one of my favorite proteins in general. My one problem with it? I always seem to struggle with remembering to thaw fish in my freezer before dinner! But I’m in the business of finding solutions, and forgetting to thaw my fish is just an excuse waiting for a solution. So here we are! The EASIEST salmon recipe ever! This foolproof salmon recipe places frozen salmon fillets in the instant pot and you’ll have perfectly steamed fish in less than fifteen minutes. YES, from frozen fillets! 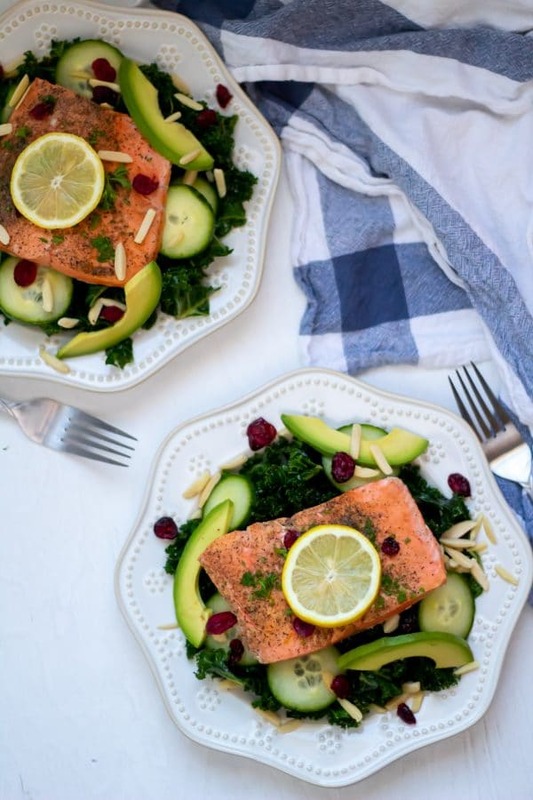 If you’ve got your life together more than me and happen to have thawed or fresh salmon, you can still make this instant pot salmon recipe – you’ll just need to knock off a couple minutes of cook time (literally – set for 3 instead of 5 minutes). Now with such a simple recipe, it’s important to use quality ingredients. In this case – a quality salmon. So what kind of salmon is best? Realistically – whatever you have or can afford! That said, wild Alaskan salmon is my favorite when it comes to health benefits and sustainability. You can buy wild Alaskan salmon at different stores, just depending on what you have available to you in your local markets. And it doesn’t have to be fresh, FYI – you can purchase frozen wild Alaskan salmon that still retains all the health benefits (in fact, often has more than fresh that was caught a while ago!). However, my current favorite go-to place to find wild Alaskan salmon is actually ButcherBox! ButcherBox is a subscription meat delivery service that offers the highest quality products (think organic free range chicken, grass-fed and grass-finished beef, heritage pork). 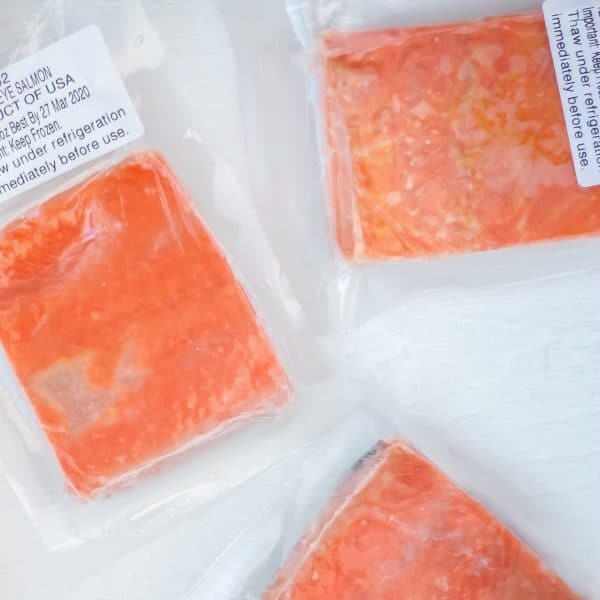 They’ve offered wild Alaskan sockeye salmon as occasional promos in the past but recently announced that salmon is here to stay as a part of their permanent product line up (available as a subscription box option and add-on). To celebrate, for the month of January 2019, they’re offering FREE SALMON to all new customers! Yes, seriously! 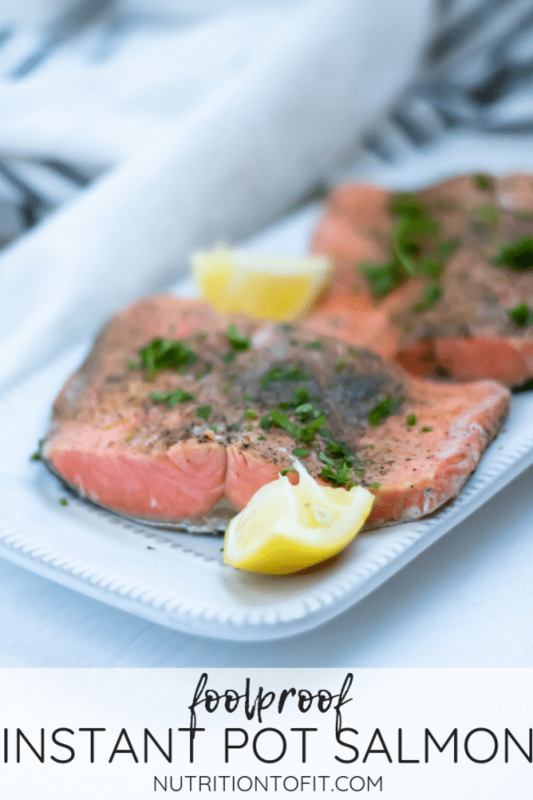 For this limited time, each new customer will get 2 pounds wild Alaskan salmon frozen fillets (the same I used in this recipe!) FREE with their first order! And I have to say, these are the best frozen salmon fillets I’ve tried! And full disclosure, this is an affiliate link, meaning if you use my link I’ll get a small commission at no additional cost to you. Thank you for your support of NTF! So there are two main things you need for this recipe. First is quality salmon – check! Second? An Instant Pot (Amazon affiliate link)! Yup – I’m officially aboard team Instant Pot and it’s all love! 😉 I have always waited forever and ever to hop on new trends (I am NOT a trendy person), but I finally came around! My husband gave me an 8qt Instant Pot for Christmas and we’ve already been loving how fast and easy it’s made some of our dinners and meal prep! What is an Instant Pot? In short, it’s an electric pressure cooker. Most people seem to have either the 6 quart or 8 quart Instant Pot and you can use either size in this recipe. I will be the first to admit – this instant pot salmon recipe is SUPER basic. But it’s designed that way on purpose. I want to help equip you guys with easy recipe basics that you can use over and over again in different ways. 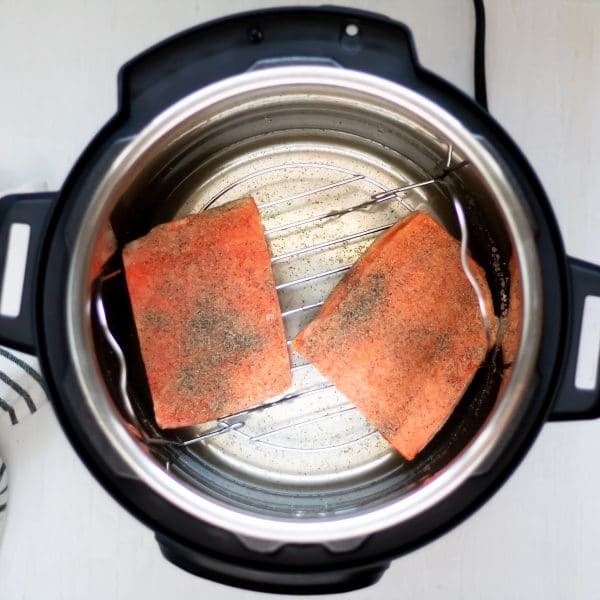 While I feel like it can be a little difficult to get flavor to stick with steamed salmon in the Instant Pot like this, you can totally use any type of seasoning on your salmon in addition to or instead of salt and pepper. Think: Old Bay seasoning, garlic powder, dried herbs, curry powder, etc. You can also try infusing flavor by layering slices of citrus fruit (i.e. lemon or orange) on top of the salmon as it cooks. Or even substituting some of the steaming liquid for citrus juice or even white wine. The other option (and my personal favorite) is to add additional flavorings and sauces after it cooks. Try my nut-free romesco sauce, 5-minute avo green sauce, my cilantro lime dressing, or a pesto sauce. Even just pairing with some fresh lemon wedges to squeeze over the salmon as you eat it can add a delicious bright flavor! Pair your salmon with some easy sides you can meal prep or throw together quickly while the salmon is cooking. If you make this foolproof, EASY Instant Pot salmon, be sure to leave a comment below and rate the recipe! And you can always take a pic and share to social media (tag me! @nutritiontofit #nutritiontofit) for a chance to be featured on my accounts! Pour water in the bottom of your Instant Pot (1 cup in the 6 quart Instant Pot and 1.5 cups in the 8 quart Instant Pot). Place the metal trivet in the bottom of the Instant Pot. Lay the salmon fillets on the trivet (don't overlap them! ), skin side down. Season with salt and pepper. For FRESH salmon: Seal your Instant Pot and set the manual high pressure setting for 3 minutes. For FROZEN salmon: Seal your Instant Pot and set the manual high pressure setting for 5 minutes. When the salmon is done, carefully quickly release the pressure. Top with any desired sauces or lemon slices and serve! If you're not a fan of the skin, the skin can easily be peeled off after steaming. Enjoy!